You know how sometimes there’s a little voice in your head that says things like ‘that’s not fair’ or ‘that stupid idiot missing the goal’ or ‘I wonder if Mel still wants to be friends with me’. 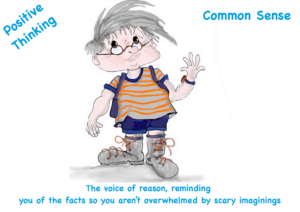 Most of the time these voices are just thoughts but sometimes they are attached to some strong feelings such as excitement, anger, disgust, fear or misery. We make sense of the world by how we think about things. Some ways of thinking are helpful – but others are not. They can make tricky situations worse and make us feel bad. These six wellbeing stories are about alternative ways of thinking. 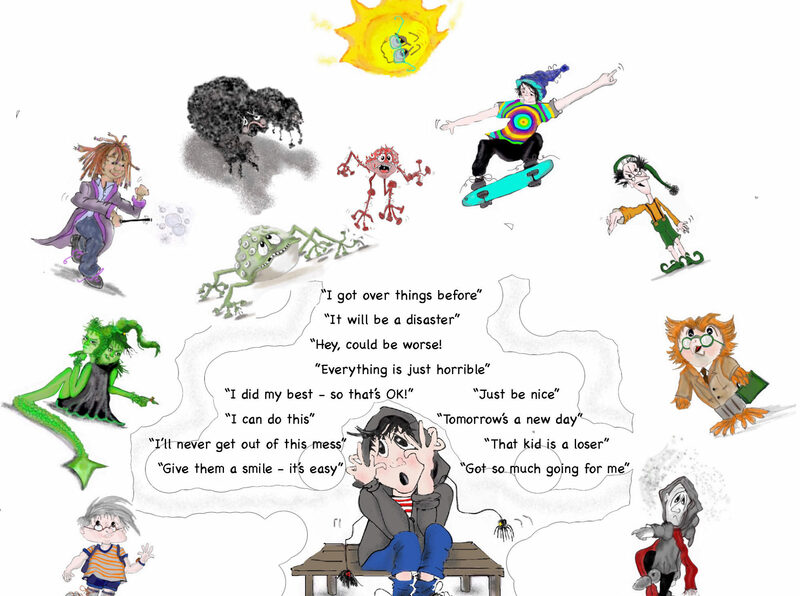 There are ten characters to represent different kinds of self-talk. These are either helpful to you or really not helpful at all and get in the way of your wellbeing big time! The positive characters give you good ideas and good feelings but the negative ones usually make you feel horrible. They sometimes encourage you to think nasty things about other people. Recognising these different voices shows there are choices about how you see the world and how you deal with what happens to you. Making friends with the positive characters will help you bounce back when things are tough. It is hard to do this all by yourself so in each story someone else lends a hand. 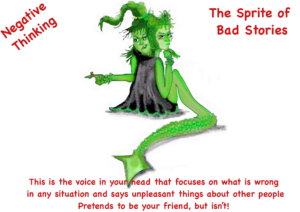 The main theme incorporates characters representing positive and negative thinking and the difference these make on how you see yourself, other people and the situations you face. There are, however, other strands that link to resilience, such as the power of positive relationships and supportive peers and adults. The psychologies underpinning the stories are positive, narrative, and cognitive behavioural. Every suggestion has an evidence base. 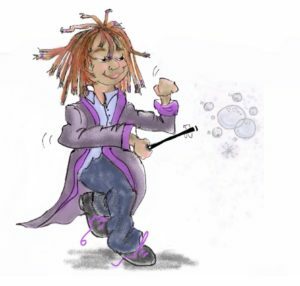 The stories are written for 8-11 year olds but are not intended to be stand-alone narratives. Each story, divided into ten short chapters, is accompanied by a teacher toolkit and a family toolkit. The Family Toolkits go into more depth about the issue the story is addressing and suggest ways families can help. 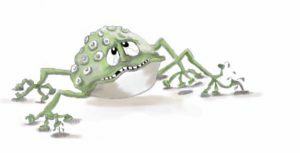 Each toolkit also covers suggestions about how to talk with children about the story. There are links to resources, including on-line organisations, further reading and video clips. Printed copies of the stories are available either in complete sets or as individual stories. An EDUCATION full set consists of one copy of this Introduction, the 6 Stories, the 6 Teacher Toolkits and 6 Family Toolkits, and a pack of photocopiable resources. A FAMILY full set consists of one copy of this Introduction, the 6 Stories, and 6 Family Toolkits. Click here to buy a Set. 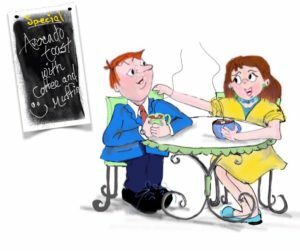 Each individual story is also available as a Family set – Story plus Family Toolkit, a Teacher set – Story plus Teacher Toolkit, or as an Education set – Story with both Toolkits. Click here to buy individual stories. 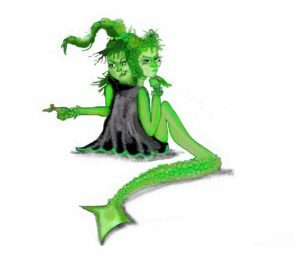 Schools who need multiple copies of the stories can purchase an electronic copy of the complete set together with a licence to print the stories for their own use. Contact admin@ growinggreatschoolsworldwide.com for more details. NB: The ‘Offer’ prices shown in the store are Introductory Offer prices that will apply through to the end of 2018. The stories have not previously been available at the higher price. First are the nasty NEGATIVE VOICES. You will probably recognise some of these. The Worry Wart is a small persistent whine of a voice. Nearly everyone has a worry wart. They are irritating and hard to shake off. Worry Warts imagine that the worst will happen. 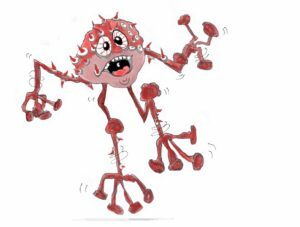 When the Worry Wart spends time with SoBS it can turn into a Panic Monster. 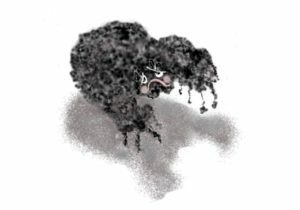 Panic Monsters are very loud and difficult to control. They stop you thinking straight. 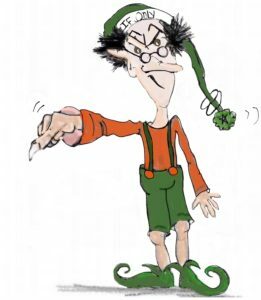 The If-Only Elf often works through other people to create havoc and stress. He says what should have happened, but didn’t, and its too late now. Imagine his long pointy fingers accusing people and making them feel stupid. If-Only Elf can block out what might make things better now. 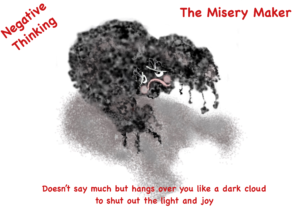 The Misery Maker is not so much a voice as a sigh and a shadow that takes all the light and laughter out of someone’s life. 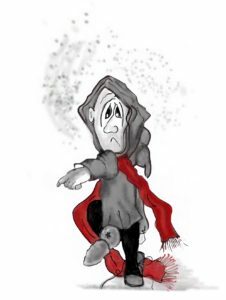 Other people stay away from the Misery Maker because the misery is catching – like a virus of gloom. Now for the POSITIVE VOICES. These can make all the difference to your life, the way you see things and what helps you cope with tough situations. ZIP sees the best in everyone and looks for the best in everything. 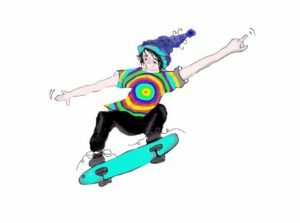 Full of fun, energy, and active kindness, ZIP zooms about on a skateboard, and can be assertive when negative voices are making someone’s life a misery. 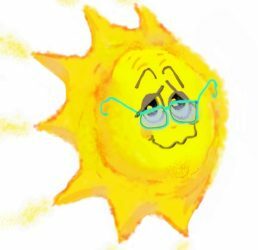 People who make ZIP a friend often have a sunny, optimistic outlook on life. ZIP is male when the main person in the story is a boy and female when the main person is a girl. S/he helps you see possibilities, reminds you of your strengths and congratulates you on what goes well. ZIP makes you feel brave, cheerful and that you are a good person. Common Sense is very down to earth and sensible and is only interested in the EVIDENCE – what really happened. She stops you jumping to conclusions too soon and imagining the worst. She helps keep things in perspective. Often an adult in your life will have a strong Common Sense voice that can be helpful but it is even better if you can listen to your own. 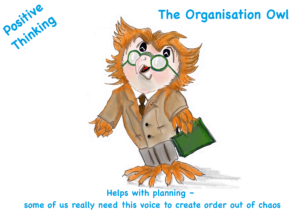 Organisation Owl is imagined as a wise old bird with thick-rimmed glasses, a notebook in his claw and a pencil in his pocket. You have met all of the characters. Now meet them in action in the stories! DANA AND THE DOOM MERCHANT addresses issues of loss and change. Dana has a history of successfully moving schools but now she is distraught because she is going to a different high school from her friends. This gives the Doom Merchant an opportunity to seed thoughts that things will never be good again. 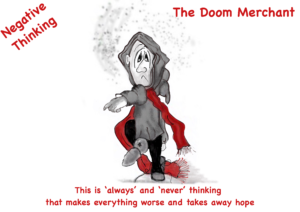 ZIP comes along and points out that the Doom Merchant is a fraud who takes away optimism and hope. 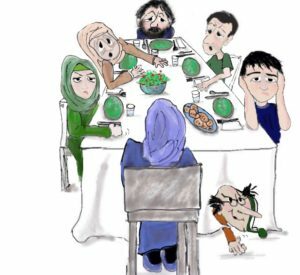 Dana tells this story from the point of view of now being in High School where things have turned out OK.
IRFAN AND THE IF-ONLY ELF deals with the dangers of perfection. The Mousa family are all doing well but high aspirations go too far. 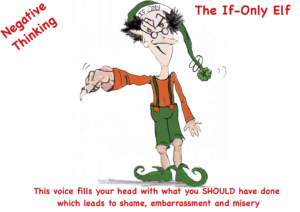 If-Only Elf works through family members to blame each other for any mistake. This all comes to a head when Irfan is in the school team for a spelling contest. The story is told by Selina, Irfan’s sister, and with the help of Common Sense she gets the family back on the right track and puts the If-Only Elf in his place. 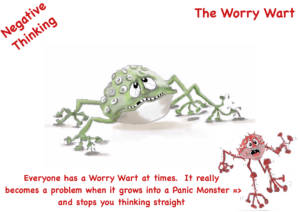 WILLIAM AND THE WORRY WART is all about how a worry can get out of hand and become a panic monster. This story is about test anxiety. 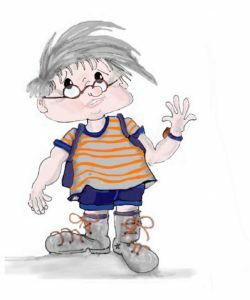 It is told by Pete, William’s older brother who enlists the help of Common Sense and ZIP so Willliam gets through the tests without falling apart. 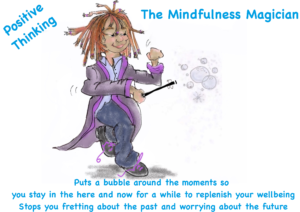 MIA AND THE MINDFULNESS MAGICIAN shows how several emotional challenges over a short period of time can lead to depression. SoBS gives Mia one negative message after another until the Misery Maker takes over Mia’s life and drains all the joy and energy from it. 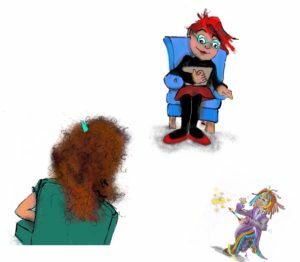 Mia’s mum eventually realises how bad things are for Mia and takes her to see a counsellor who introduces her to the Mindfulness Magician and suggests Mia invites him in to help. 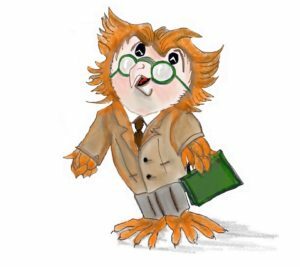 OLIVER AND THE ORGANISATION OWL: Ahn is Ollie’s best friend and notices how he is getting into more and more difficulty at school. 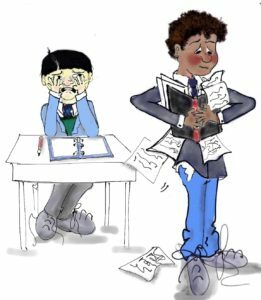 He never seems to have what he needs in school – from books to sports kit to homework. 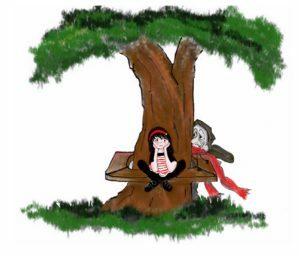 This is traced back to Oliver’s parents splitting up and spending time in two houses. Ahn points out that the Misery Maker is making Ollie no fun to be around and suggests that he enlists the help of Organisation Owl to get things sorted. 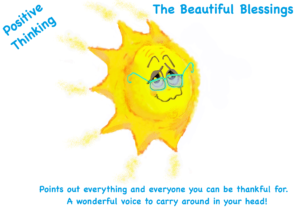 BENJI AND THE BEAUTIFUL BLESSINGS is about a primary school teacher who is a real misery. No one wants to be in his class even if he does get good results. He is best friends with SoBS who makes him think that he is entitled to everything and everyone else is a waste of space. Things change when Belle arrives at the school as a new teacher and to Benji’s great surprise takes an interest in him and then introduces him to the Beautiful Blessings. This turns out to be transformative. Sue Roffey FRSA FBPsS has been a parent, teacher, educational psychologist and academic. She is honorary a/professor at Western Sydney and Exeter Universities and Director of Growing Great Schools Worldwide. 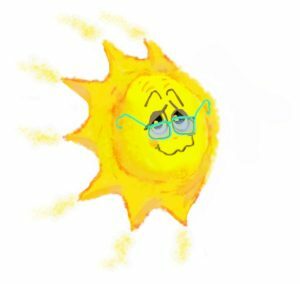 Sue is an international authority on school and student wellbeing, with numerous publications on behaviour, relationships and social and emotional learning. Keith Heggart FRSA is a teacher, academic and union organiser. 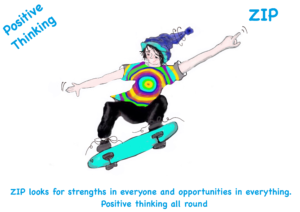 During his teaching career, he developed expertise in social and emotional learning based on his experiences working with children in challenging circumstances, and he has brought some of those experiences to the development of the Wellbeing Stories. He is also a keen proponent of social justice and citizenship education. For the past thirty years Elizabeth Stanley has been a child development educator and deputy principal. Since the loss of her beloved husband and son Elizabeth has gathered her energy to seek positive ways to help others. Each illustration contains a heart and a star to remind us all to seize the moments. 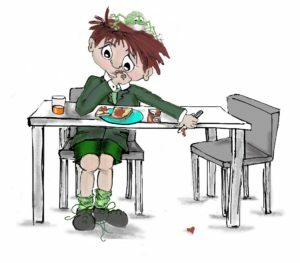 Her other illustrations include the award winning cookbook, This Book Cooks, by Kerry Dunnington and The Primary Behaviour Cookbook and Secondary Behaviour Cookbook by Sue Roffey, published by Routledge. Paul Vittles FRSA at the Royal Society of Arts Australia and New Zealand chapter was instrumental in gaining seed funding for this project. Gavin Blake (gavinblake.com.au) helped with much of the early development of the characters. Keith Heggart did the original design layout for the stories, and field tested the materials in schools. David Roffey designed and laid out all of the finished versions. Sally Jeffrey introduced us to our talented and inspirational illustrator, Beth. Avril McDonald of Feel Brave (feelbrave.com) gave advice and input that was very helpful in refining and redesigning the look and feel of the stories. These stories are dedicated to the memory of Nancy Helen Downs.